Last spring, Milo poked his finger into the earth and dropped in pre-soaked seeds in three different places in our yard. We’ll see what happens, I remember saying, expecting nothing and forgetting about them until a month later, when it was apparent that something was definitely happening. All three of the seeds had sprouted and grown overnight like the magic beans from Jack and the Beanstalk. If you’re a gardener, and you have ever grown beans, squash, or pumpkins, then you know the incredible rate at which these plants grow… multiply that times ten, and that is what we were dealing with. The long, thick vines snaked over our yard, our grass, over our fence into the neighbor’s yard, into the back alley and beyond. We cut them back as they enveloped our back deck, allowing only the side to go somewhat crazy. Fragrant white flowers bloomed and opened only when the air cooled enough in the early mornings and evenings of that summer, and in their own right, they were beautiful and magical. Our neighbors teased us, our friends laughed openly at our situation. But I have such a good idea! I had assured them. 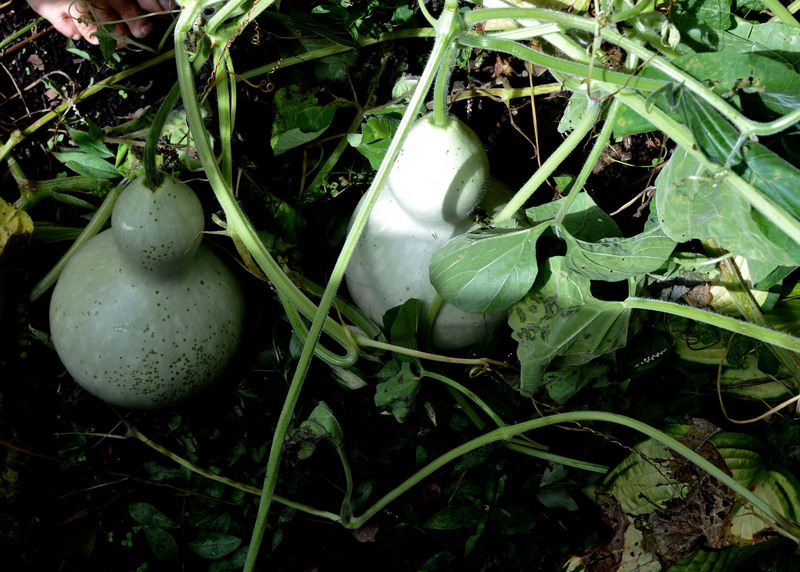 I had wanted to grow enough gourds for all the neighborhood children (there are a lot of them now!) 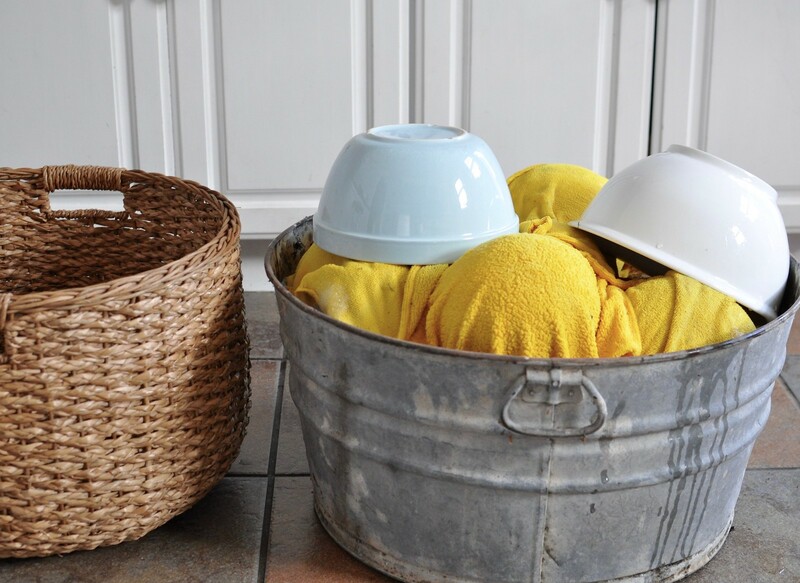 so that they could each have one once they had dried, and we would have a birdhouse-making party on our back deck. I imagined us all gathered around a few tables on a cool evening, drilling and sanding and painting together. As summer rolled on, I started to realize what we had gotten ourselves into. The vines had taken over half of the back yard, even as I trimmed them back on a daily basis. 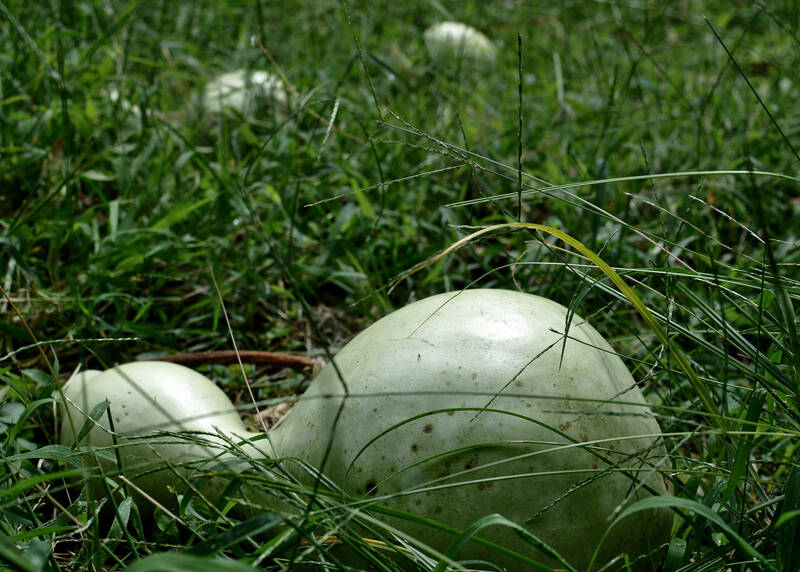 The gourds lay like corpses in the unkempt grass; we could not mow the lawn where they lay, as the long vines tangled and wound around the blades of our mower. Plus, we had already put so much time tending to them, I figured, we may as well see this thing through. 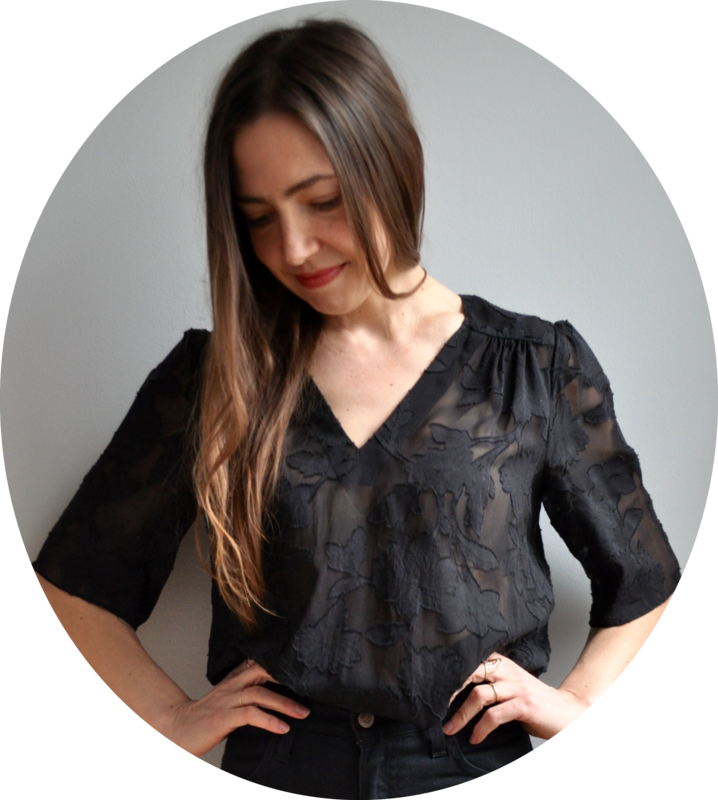 By October, the vines began to die. It’s time to clean up this mess, urged Andrew. But we can’t! Now we have to let them dry on the vines! I insisted. After doing a bit of research online, I found out that our birdhouse project was more like an 8-month-long process instead of the couple-of-months project I had assumed. 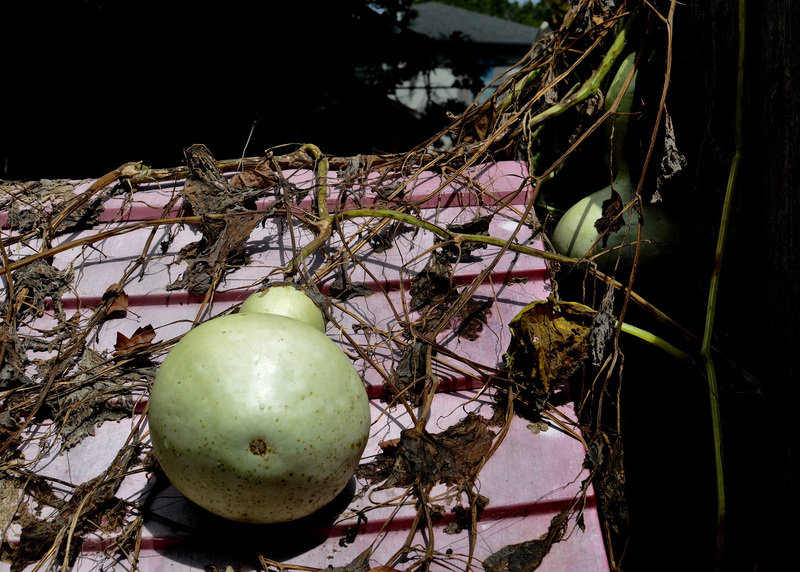 The next step of the process was drying them outdoors, but we soon learned that the squirrels were going to decimate the gourds, chewing holes to get to the seeds, then going on to the next gourd. 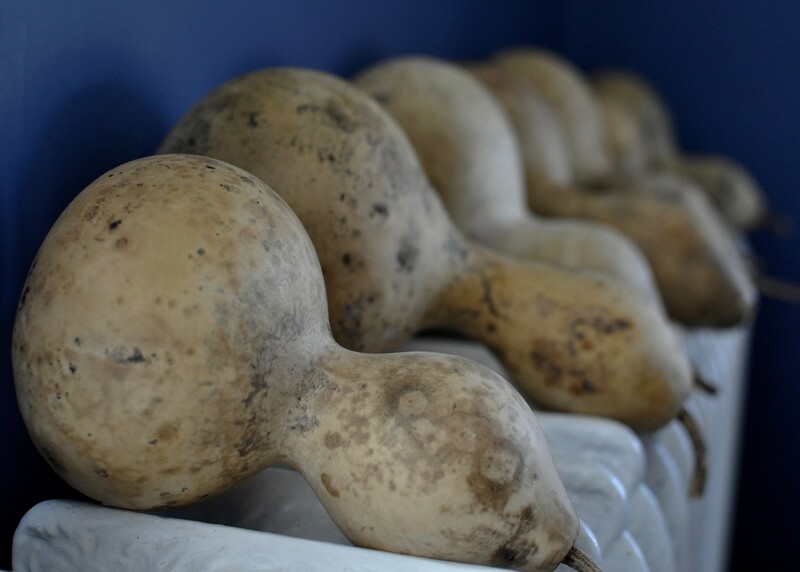 Of 37 gourds we had harvested, only about 20 survived, and that was even after moving them to the garage (the squirrels found their way inside the garage). Of those 20, some had developed weak spots and crumbled in places. There weren’t many left, but still I wanted to try to see the project through. 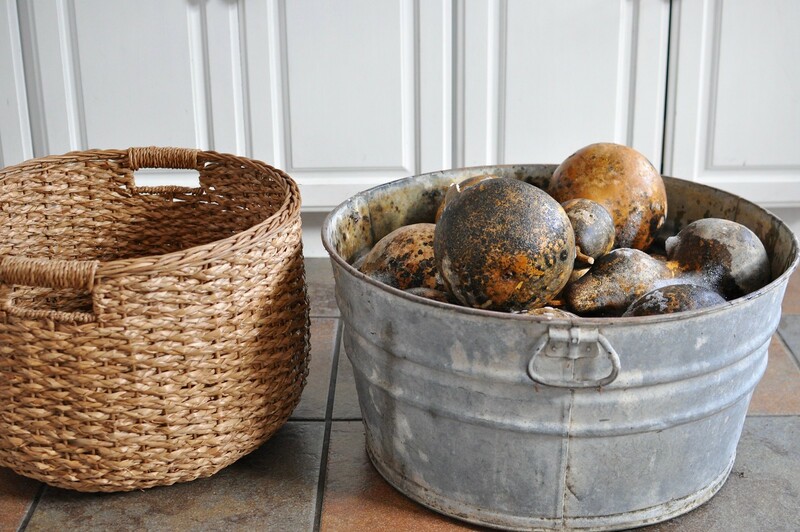 After 4 months of drying (you can tell they are ready because they become very lightweight and when you shake them, you should hear the seeds rattling around inside), I brought the gourds inside to clean them. 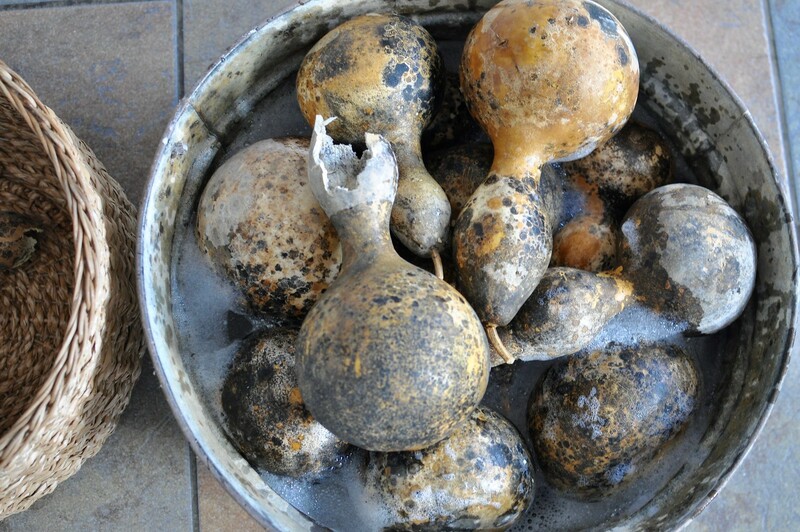 As gourds dry, they naturally grow mold on the outside, and the skin begins to peel. 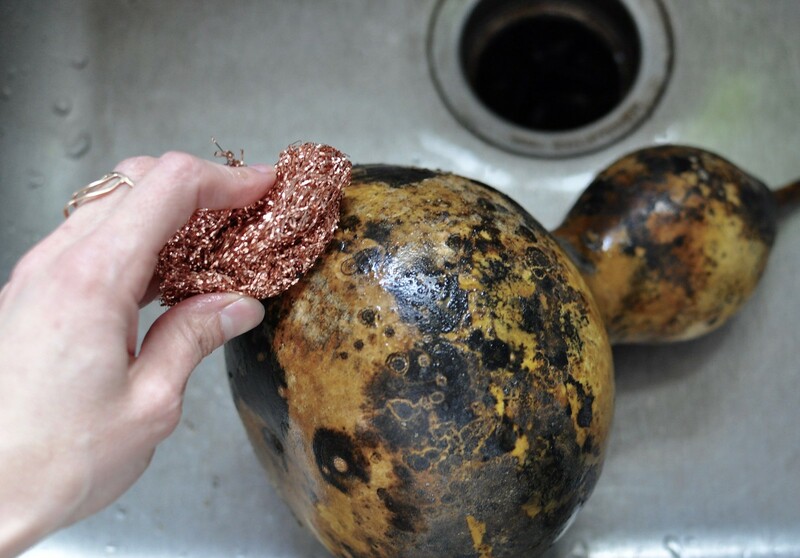 To make the process easier of removing the mold and skin, I soaked the gourds in water with dish soap, weighing them down with heavy bowls, for about 4 hours. I then cleaned them under clean running water in the sink with scouring pad. The mold and skin came off easily. 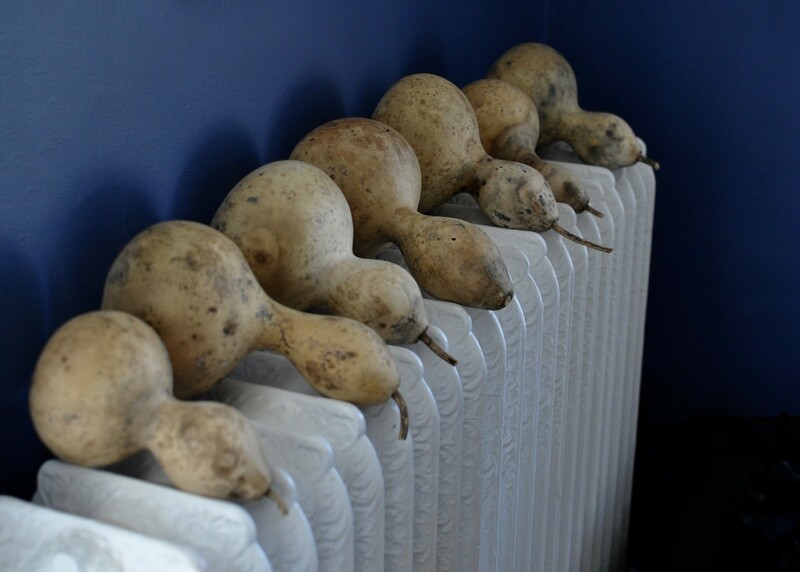 After scrubbing, I stacked the gourds on our warm radiators to dry. Some discoloration and mottled appearance is normal, as long as there are no soft spots. Once dry, I started the process of cleaning out the seeds. 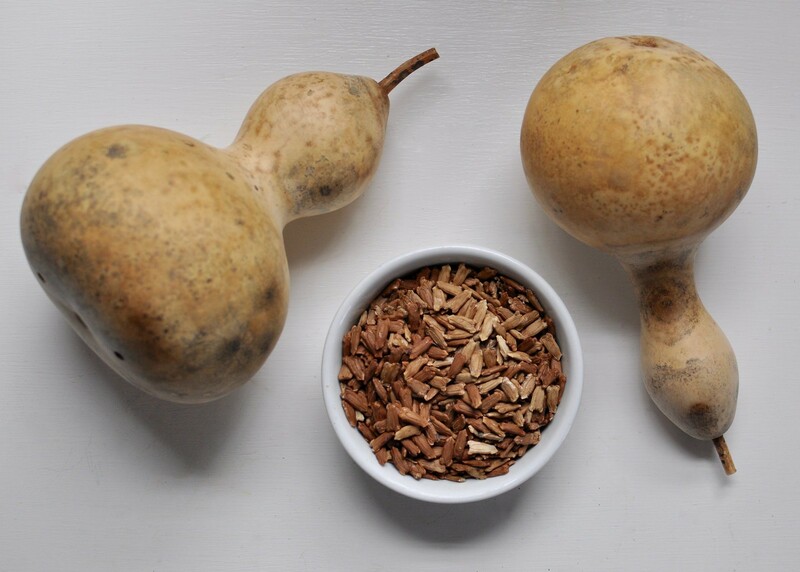 It’s important to note that if you are going to repeat the whole process next spring, only save the seeds from the best gourds, as they will most likely carry on the genes of the best plants. There are different methods of cleaning out the seeds. Some recommend using a small jigsaw to cut the crescent shapes in the gourds, but we didn’t have one, and I found that carefully using a small paring knife worked just fine. I cut crescent shaped holes, then used a tablespoon to scoop out the seeds and dried flesh, which came out very easily. I then sanded the entrance with sandpaper, and with a metal file to smooth out any rough cuts. 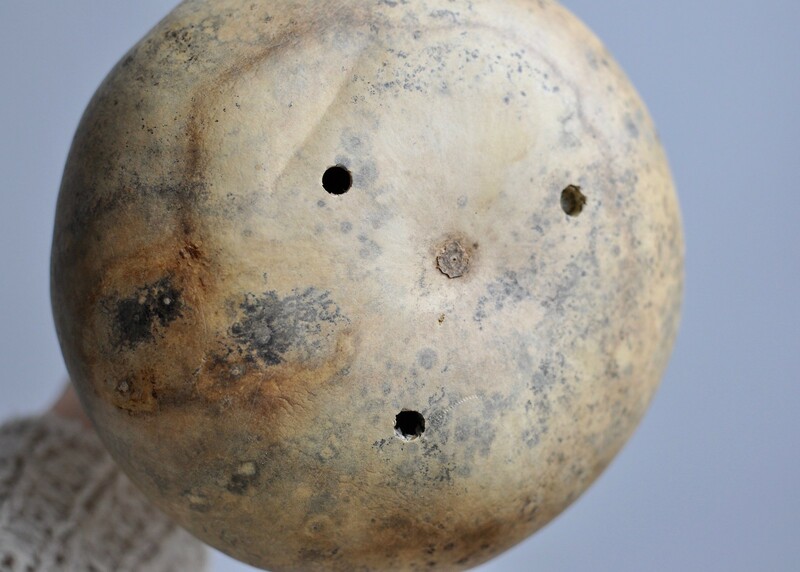 Next, I drilled three holes into the bottom of each gourd to let rainwater drain out. 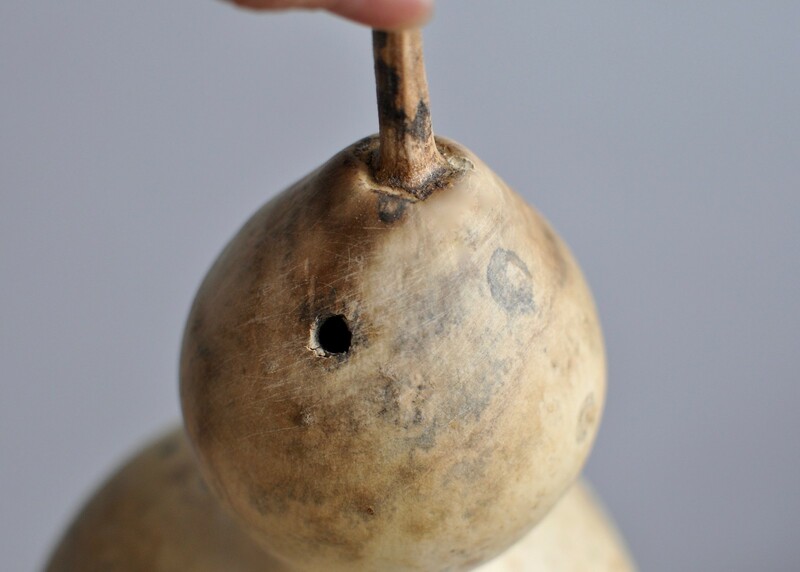 Next, I used the drill to put two holes in the tops of the gourds to hang string through. If you have a large crochet needle, you can thread hemp, wire, or string through the holes for a hanger. The crescent holes are essential for protecting the purple martin from starling nest raids, as the starlings cannot fit through the crescent, while the purple martins can. Feel free to paint the outside with water resistant outdoor paint, or leave it natural, and hang high enough to avoid predators. 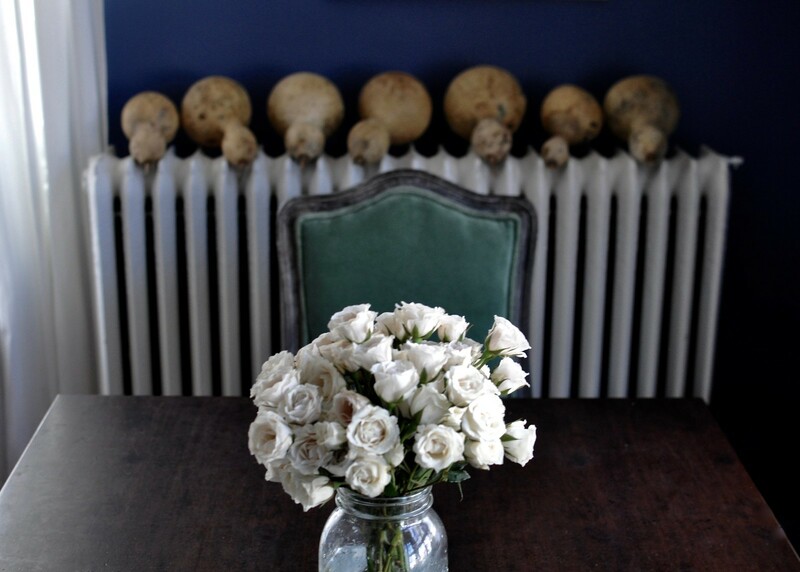 If you do paint it, be sure to paint it a light color; otherwise the inside will get too hot. 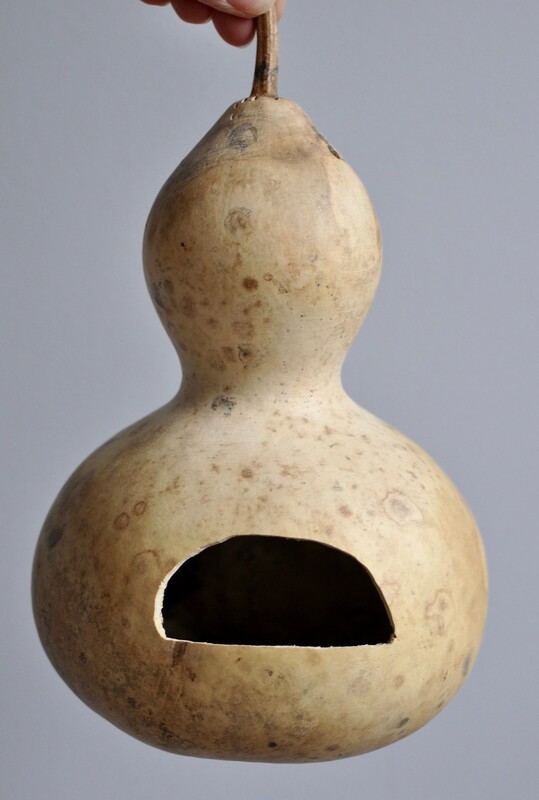 And if you are trying to attract purple martins to your garden, they do prefer to nest in colonies, so more gourds hung together is better than one. We can’t wait to hang a couple up in the springtime and see if we can encourage these amazing birds to take up residence in our yard! I love it! Good for you for seeing this project through and I hope you get some Purple Martins in your yard. Color me impressed with your stamina on this project. We should have done this years ago in our yard because we don’t even tend to our yard at all – it pretty much runs wild. But now it’s too late – it’s all going to be dug up shortly! Great project! I love the shape of the door you made. I emailed you! You are so thoughtful to offer- thank you!